Rated PG-13 for destruction, action and violence. 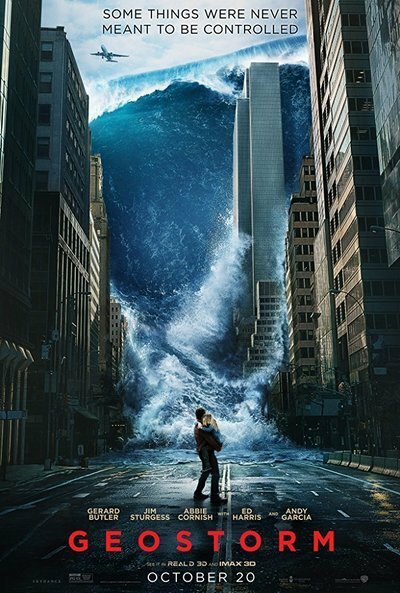 There has been some question as to whether now is the proper time to release a film like “Geostorm” and not just because it arrives in theaters bearing all the hallmarks of a cinematic disaster in the making: numerous release date changes, reports of extensive reshoots that eliminated some characters entirely while introducing new ones, and the presence of Gerard Butler in the lead role. No, the question is whether the general public will be in a mood to see a movie in which the entire planet is threatened with attacks of extreme weather in the wake of all the meteorological chaos of the last few weeks. As it turns out, people who were leery of going to see it for that reason can rest easy because, despite the ad campaign to the contrary, the film is actually an utterly idiotic and oftentimes boring amalgamation of “The Day After Tomorrow,” “San Andreas,” “Gravity,” “The Manchurian Candidate” and the lesser Irwin Allen productions. “Geostorm” fails to work either as awe-inspiring spectacle or as campy silliness. As the film opens, we learn that Earth was hit with a series of catastrophic extreme weather events in 2019 that wiped out entire cities. Finally recognizing the dangers of global warming (which proves that the film is a fantasy), the U.S. joins the other countries of the world to combat it by taking point in the creation of a massive satellite system, nicknamed “Dutch Boy” because why not, that tracks extreme weather systems and eliminates them before the destruction can begin. Dutch Boy is the brainchild of two-fisted, hard-drinking and inexplicably Scottish American scientist Jake Lawson (Butler) who runs the system along with an international crew up in space. However, he is one of those guys who just cares too much and when a Senate hearing goes sideways, he is fired from the project by its new head, his own brother, Max (a burr-free Jim Sturgess). Three years later, the U.S. is about to cede its authority over Dutch Boy to all the countries of the world when a mishap occurs involving a malfunctioning satellite and an entire village in the theoretically sweltering Afghanistan desert is flash frozen as a result. Not wanting to turn over a flawed system, the President of the United States (Andy Garcia) opts to have Max send someone up to find out what happened and fix it and (spoiler alert) Jake ends up going up to do it. After about six minutes, Jake and the station commander (Alexandra Maria Lara) figure out that system has been sabotaged, a conclusion that Max also comes to down on Earth. While other cities are hit with insane weather—Tokyo gets hail the size of canned Okja while a bikini babe in Rio is seen trying to outrun the cold—the two brothers try to get to the bottom of what appears to be a massive conspiracy and stop it before the satellites can create a “geostorm,” an ever-expanding mass of cataclysmic weather that could kill untold millions throughout the world. You know how when a big-ticket genre film comes out and within a couple of weeks, there will already be a knockoff of it featuring cut-rate special effects, an utterly insane storyline and B-level actors (if we are lucky) traipsing through the silliness in exchange for a quick paycheck? “Geostorm” feels like the first $120 million (according to the studio) version of such a film—the effects may be somewhat better than the stuff you see on the Syfy network but even the producers over there might have blanched at the nonsense offered. To mention all of the major problems here would run the risk of turning this review into a mere list, so I will only highlight a couple of them. For starters, our hero is a loud, obnoxious jerk that few people would want to spend any amount of time with and I fear that Butler embodies that characteristic to a T—you spend the first half of the movie hoping that the film is going to pull an “Executive Decision” and knock him out early so that the real and actually likable hero can come in and save the day. And the conspiracy angle doesn’t work because A.) the elaborate plot doesn’t make any sense even by dumb action film standards and B.) the bad guy is so patently obvious that most people will be able to figure it out just by looking at the credits on the poster. And, oh yeah, there are any number of extraneous subplots—Jake’s relationship with his disappointed moppet of a daughter and Max’s supposedly clandestine affair with a Secret Service agent (Abbie Cornish, who actually can act and whose presence here is all the more disappointing as a result)—that not only do nothing but eat up screen time but linger over the meal at length to boot. It all sounds absolutely ridiculous but the real disappointment about “Geostorm” is that it doesn’t even work as the camp suggested by the trailer. Yes, there are scenes of weather-related destruction but there are only a couple of points—a sudden temperature spike in Hong Kong causing gas main explosions that level much of the city and wild lighting strikes over Orlando—where we get to see them play out at length. The rest are often reduced to brief bits that offer just enough footage to make the trailer seem a little more spectacular but not enough to help the movie. In either case, they lack the lavish visual pyrotechnics nor the wit or style to make any of the destruction slightly memorable. This is all stuff that you have seen better before—even the aforementioned bit of someone trying to outrun the cold comes directly from “The Day After Tomorrow,” a film that I am fairly certain that director/co-writer Dean Devlin is familiar with since it was directed by Roland Emmerich, the guy he collaborated with on “Stargate,” “Godzilla” and the “Independence Day” films. God knows how many millions of dollars and hours of manpower went into making and remaking “Geostorm” but it turns out to have been all for naught. You would think that with a premise so goofy and with so much money thrown at it, a movie like this would at least be somewhat memorable, but "Geostorm" is so completely forgettable that it will begin to slip from your memory before you get to the parking lot and will have completely faded away by the time you get home. I never dreamed that the day would come when I would say these words, but “Geostorm” is a film that really could have used a Sharknado or two to liven things up.